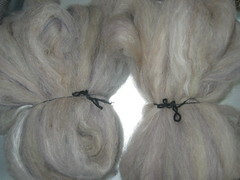 Midnightsky Fibers: Batts and roving! With my drumcarder I can now make blended roving! I have been having lots of fun blending wools with mohair to create nice slightly halo-y roving and batts (some of which will be in the update Thursday, in addition to vegan yarns!). I had an accidental felting. 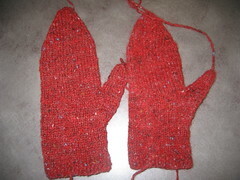 The larger mitten is AFTER I washed it too to try and make it shrink to size. I will wash it again to see. They still fit me felted, but the cuff is too short. Notice something wrong here? I totally killed my sewing machine. 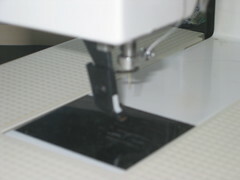 The foot broke off, the needle broke (and it still at large), and it started going when I was not pushing the pedal. Scary! I had a breakable day yesterday, also shattering one of my wine glasses *everywhere*.